Imagine that you’re building a B2B SaaS startup from scratch. What are you focused on? Well, you’ll need to ensure product-market fit. From there, you’ll need to understand the sales ecosystem your SaaS startup operates in. You’ll want to put together your team, made up of multi-talented team members just as passionate as you are. Eventually, you’ll want to start working on developing a brand voice and general marketing strategies. But before all that, you have one major decision to make: where on earth are you going to build your startup? Make no mistake: where you choose to build your startup can have a massive impact on the overall success of your efforts. Quick: if someone asked you to list the most popular SaaS ecosystems around the world, what would you say? Chances are that ‘the Bay Area’ would be your first guess, with NYC falling somewhere in your top five. Which makes sense -- if we’re focusing on the past. 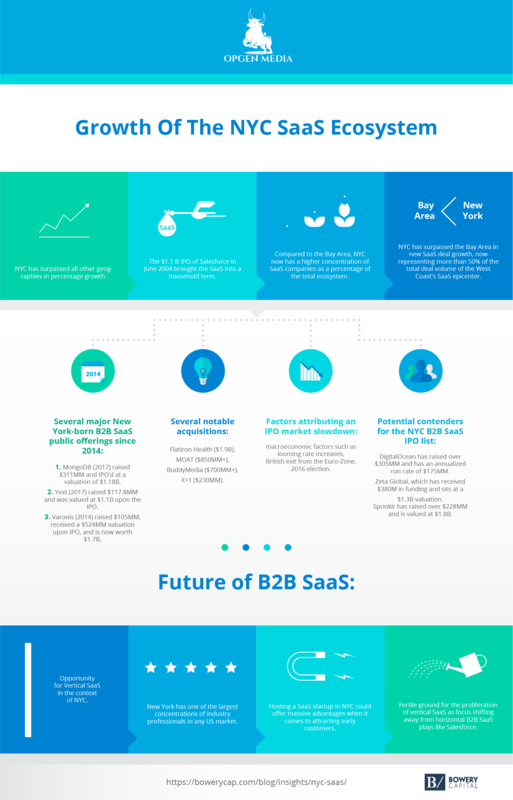 After all, Silicon Valley has historically been home to B2B SaaS startups looking to make a name for themselves. But times change, and Silicon Valley isn’t the only SaaS ecosystem with fertile ground these days. We know what you’re thinking. NYC has always been seen as Silicon Valley’s east coast little brother, why would that be any different now? Well, because NYC has changed pretty significantly over the last decade, as our friends at Bowery Capital can tell you. Gone are the days were the NYC ecosystem relies on a single company to prove that the entire ecosystem is worth being a part of. Even when compared to Silicon Valley, NYC boasts a higher concentration of SaaS companies in comparison to its total ecosystem. And when you combine that with SaaS growth that exceeds any other location on the planet, it’s no wonder why more and more SaaS startups are deciding to settle down in NYC. Alright, so there’s plenty of info above, but what can we take away from all this? Right of the bat, we need to talk about the raw potential that this ecosystem has to offer. We all know that startups have a bit of an employee retention issue. No use in shying away from it, it’s just the nature of the industry. Fortunately, NYC B2B SaaS startups have access to one of the largest concentrations of potential employees in any US market. And if you’re looking to focus on vertical SaaS (focusing on customers in a specific industry, while offering targeted, high-quality solutions), NYC’s SaaS ecosystem may just be the perfect fit for you. One thing’s for sure: with impressive growth, a history of notable public offerings and acquisitions, and more SaaS deal growth than the Bay Area, NYC is well on its way to dominating the B2B SaaS ecosystem for years to come.